Keep the sand in your shoes all year long. Coastal Community Capital A Division of Cape & Islands Community Development, Inc. HERE ARE SOME OF THEIR STORIES! "A few years after we started our full-service landscaping business, Cape Cod Tree & Landscape, we began to grow pretty rapidly. With this growth came constant maintenance and repair issues with our equipment—so integral to our business. Mounting expenses for these repairs was becoming a real challenge, ultimately prohibiting further growth. A loan from the Community Development Partnership, supported by funds from the Cape & Islands License Plates, bridged the gap for us, allowing us to take our business to the next level. We now have 9 employees and manage accounts from Eastham to Dennisport." "When my husband and I returned to Cape Cod in 2011 we had a dream: to open a food business that would serve up fresh local food, but also be a warm, engaging place both for our staff and for the community. With a start-up loan from the Community Development Partnership in 2012, we opened the Sunbird Food Truck in Wellfleet and began to make our dream a reality. The CDP’s loan program is supported with Cape & Islands License Plate funds. Two and a half years later another small loan from the CDP rounded out local bank financing to enable us to open our brick and mortar Sunbird Kitchen in Orleans. We have always said that 'it takes a flock' to help us grow our business." “Cape and Islands License Plate grant funds helped jump start the Buy Fresh Buy Local Cape Cod program, which connects people on Cape Cod with locally grown farm and sea products. Agriculture, aquaculture and commercial fishing are an important part of the Cape’s economy. The financial support of the Buy Fresh Buy Local program helps preserve these important Cape Cod industries! The list continues to grow! Join the team. This is the most thoughtful and powerful Cape & Islands campaign ever. One way or another, it touches you. 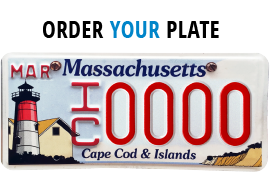 Get your plate now!